Staphylococcus haemolyticus is one of the coagulase-negative staphylococci (CNS). There is a close relationship to S. epidermidis. Staphylococcus Haemolyticus is like other CNS to the normal flora of the skin and mucous membranes of humans. Most can be in an individual only one or two strains detected. Staphylococcus haemolyticus is associated with various diseases in conjunction, such as bacteremia / sepsis, wound infections, urinary tract infections and conjunctivitis. The content of all infections caused by CNS is less than 15%. The name Staphylococcus Haemolyticus results from the ability to hemolysis. The hemolysin produced are, however, probably not related to the classical hemolysins of S. aureus. 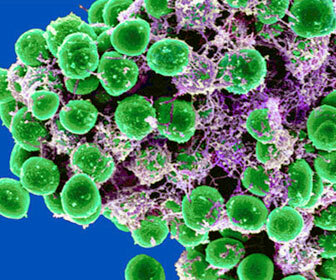 The hemolytic activity of Staphylococcus Haemolyticus is significantly lower than that of S. aureus. Overall, the pathogenicity of Staphylococcus Haemolyticus in non-immunocompromised patients is rather low. On the other hand, has been reported (with a higher than average proportion of Staphylococcus Haemolyticus) at excitation spectrum of infections in premature and newborn infants in the last several years of increased CNS. It is associated with CNS sepsis incidence in very small premature infants, the numerous foreign body (catheter tube) to be supplied, particularly high. Calculated for the treatment of suspected CNS infection is due to the high rate of multidrug-resistant pathogens, a glycopeptide (eg vancomycin), optionally in combination with rifampicin (RIFA etc.) and / or an aminoglycoside (eg, gentamicin, gentamicin and others) into consideration. Teicoplanin is where Staphylococcus Haemolyticus is often observed as an average infectious agent (on neonatal intensive care units, for example) is not recommended as a treatment of choice. See www.ndrugs.com for medications. For targeted therapy is usually vancomycin, the drug of choice. Alternatively, there are linezolid or quinupristin / dalfopristin available. Severe infections should be initially treated with a combination of antibiotics such as vancomycin plus rifampin. As in the proof of the other CNS findings is considered questionable when Staphylococcus Haemolyticus was grown from only one of several blood cultures. Staphylococcus Haemolyticus strains are often multiresistant, which makes the antibiotic therapy. According to the study, resistance of the Paul Ehrlich Society for Chemotherapy from 2001, more than 70% of the tested isolates to ß-lactam antibiotics, macrolides and fluoroquinolones were resistant. Furthermore, the strains studied to 30-50% showed reduced susceptibility or resistance to aminoglycosides and 8% to teicoplanin (Targocid). In contrast, all isolates were susceptible to vancomycin (VANCOMYCIN others), linezolid (Zyvox) and the streptogramin combination quinupristin / dalfopristin (Synercid).